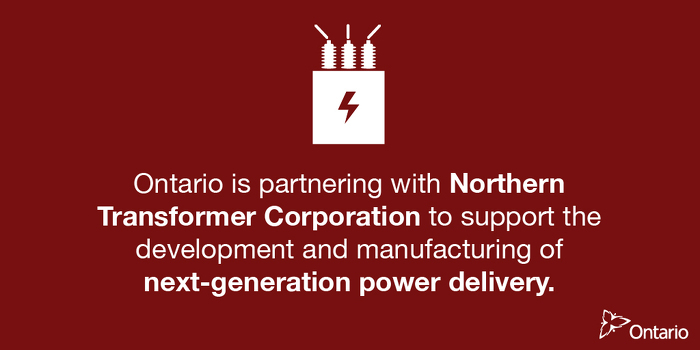 Ontario is partnering with Northern Transformer Corporation to support the development and manufacturing of next-generation power delivery. The project will help create 60 jobs and retain 82 jobs in Maple. Since 1981, Northern Transformer has been a leading manufacturer of liquid-filled transformers for utilities, renewable energy developers and the energy and resources sector. With support from Ontario's Jobs and Prosperity Fund, Northern Transformer will scale up its current product offerings by purchasing new equipment, expanding its facility, and investing in the development of new prototypes. The enhancements will enable the company to expand into new markets such as the U.S. and Europe. Creating good jobs and helping businesses grow is part of the government's plan to support care, create opportunity and make life more affordable during this period of rapid economic change. The plan includes free prescription drugs for everyone under 25, and 65 or over, through the biggest expansion of medicare in a generation, free tuition for hundreds of thousands of students, a higher minimum wage and better working conditions, and free preschool child care from 2 ½ to kindergarten. Ontario is investing $2 million through the Jobs and Prosperity Fund, supporting an additional eligible investment of more than $20 million from Northern Transformer for a total project value of $39.1 million. The project is expected to be completed in 2024. The Jobs and Prosperity Fund helps secure private sector investment in Ontario, allowing the government to partner with businesses that are creating jobs and enhancing productivity, innovation and exports. Every dollar invested through the fund leverages an average of $10 in private sector investments. Since January 2013, Ontario has committed over $950 million in projects administered under the JPF, leveraging over $12 billion in total investment. This is helping to create and retain approximately 55,000 jobs. As part of the Good Jobs and Growth Plan in the 2018 Budget, Ontario will renew, enhance and extend the Jobs and Prosperity Fund with an increase of $900 million over the next 10 years. The fund will support investments designed to help Ontario’s businesses grow with the aim of creating and retaining over 70,000 jobs in Ontario and leveraging more than $9 billion in private-sector investments.